Giants: Leo Durocher (mgr. ), Monte Irvin, Willie Mays, Hoyt Wilhelm. Indians: Al López (mgr. ), Larry Doby, Bob Lemon, Early Wynn, Hal Newhouser, Bob Feller. The Indians, by winning the American League pennant, kept the Yankees from having a chance to win their sixth straight series. The last time the Yankees had not won the series or pennant beforehand was 1948, when, again, the Indians kept them out (although that year, they won the Series). It was also the only World Series from 1949 to 1958 which did not feature the Yankees. The Indians easily won the 1954 pennant on the strength of the American League's top pitching staff, leading the AL in team ERA at 2.72 and complete games with 77. Pitchers Early Wynn (23–11, 2.73 ERA) and Bob Lemon (23–7, 2.72 ERA) were in top form, with solid contributions from Mike Garcia (19–8, 2.64) and Art Houtterman (15–7, 3.35). Bob Feller, at age 35, could only make 19 starts, and finished at 13–3. Cleveland also had potent hitting, leading the AL in home runs (156) and finishing second in runs scored (746), although the team managed just 30 stolen bases in 63 attempts. Bobby Ávila led the offense with 112 runs and a .341 average, while Larry Doby (.272 avg, 32 HRs, 126 RBIs) and Al Rosen (.300 avg, 24 HRs, 102 RBIs) provided the power. Defensively catcher Jim Hegan made only four errors in 134 games and threw out 44% of would-be base stealers. The New York Giants entered the World Series with a top flight pitching staff as well, with Johnny Antonelli (21–7, 2.30 ERA), Rubén Gómez (17–9, 2.88), and 37-year-old Sal "The Barber" Maglie (14–6, 3.26). The Giants relied more heavily on relief pitching with Hoyt Wilhelm (12–7, 2.10, 7 saves) and Marv Grissom (10–7, 2.35, 19 saves) rounding out a staff that led the NL in team ERA at 3.09 and shutouts with 17. Manager Leo Durocher used a solid, consistent lineup with all his starters, except for the catching position, playing in at least 135 games. Willie Mays (.345, 41 HRs 110 RBIs) led an offense that also featured Don Meuller (.342 avg), Al Dark (.293, 98 runs), Hank Thompson (26 HRs, 86 RBIs) and pinch-hitter extraordinaire Dusty Rhodes (.341 avg). Cleveland got on the board first and fast off of Sal Maglie. Leadoff man Al Smith was hit by a pitch, Bobby Ávila singled and Vic Wertz brought home both with a triple to right. Don Liddle and Marv Grissom held them scoreless for the rest of the game. Bob Lemon gave two back in the third on singles by Whitey Lockman and Alvin Dark, RBI groundout by Don Mueller, a walk to Willie Mays and a Hank Thompson RBI single. And that was that until the 10th inning. Mays saved the day in the eighth after leadoff singles by Larry Doby and Al Rosen led to starting pitcher Sal Maglie being lifted for Don Liddle. Wertz's drive to deep center field would have scored both if not for Mays's memorable catch. Lemon went all the way for Cleveland, losing it in the 10th when Dusty Rhodes, pinch-hitting for Monte Irvin with two Giants on base, hit a walk-off home run. Dusty Rhodes of the New York Giants rounds first base after hitting a home run during the seventh inning of the second game of the 1954 World Series. Once again, the visitors started quickly, then could not hold onto their lead. Smith's leadoff home run off Johnny Antonelli put Cleveland up before a lot of Polo Grounds fans had settled into their seats. Early Wynn preserved that lead, pitching four perfect innings, until the fifth inning, but after Mays walked and Thompson singled, once again Dusty Rhodes pinch-hit for Monte Irvin and came through, this time with an RBI single. Antonelli himself got the go-ahead run home against his counterpart, scoring Thompson on a groundout. Antonelli was a little wild on the mound, walking six, but also struck out nine. New York got just four hits all day, but Rhodes padded their lead with a home run leading off the seventh. Their other hit came in the sixth on an Al Dark leadoff single. Antonelli pitched a complete game to give the Giants a 2–0 series lead. This would be the last postseason game at the Polo Grounds. A huge crowd, 71,555, hoped to see Cleveland get its first win, but things did not go well for the home team. It trailed 1-0 quickly when Whitey Lockman singled, took second on a groundout and scored on a hit by Willie Mays, the run unearned due to an error by shorstop George Strickland. With the bases loaded, the clutch hitter of the series, Dusty Rhodes, had a two-run single pinch-hitting in the third, and an error by the pitcher, Mike Garcia, on Davey Williams's bunt attempt gave the Giants another run to make it 4-0. The Giants added to their lead on RBI singles by Wes Westrum off of Art Houtteman in the fifth and Mays off of Ray Narleski in the sixth. Ruben Gomez gave up just two runs (on Vic Wertz's home run in the seventh and in the eighth when Bill Glynn hit a leadoff double, moved to third on a groundout and scored on shortstop Al Dark's error on Al Smith's ground ball) and four hits, with knuckleballer Hoyt Wilhelm mopping up for the save. New York was now a win away from the championship. Cleveland's slim chances at a comeback took a beating as the Indians fell hopelessly behind 7-0. Almost everything went wrong from the start, after a leadoff walk and double, a pair of errors resulting in two New York runs in the second. A double by Mays in the next inning after two singles scored another run. Then the game broke wide open in the fifth. Starter Bob Lemon loaded the bases and was pulled. Hal Newhouser replaced him but got nobody out, giving up a walk to Thompson and two-run single to Irvin. The Giants added another run on Wes Westrum's sacrifice fly off of Ray Narleski. A brief glimmer of hope for the home team came in the bottom of the fifth with a couple of Giant errors and a Hank Majeski three-run pinch-hit home run, but except for a meaningless RBI single by Rudy Regalado in the seventh off of starter Don Liddle, the Indians got nothing more as Wilhelm and Game 2 starter Antonelli came on in relief and the Giants completed a four-game sweep. Hank Thompson set a World Series record for bases on balls received during a four-game series with seven and Bob Lemon set a World Series record for bases on balls given up during a four-game Series with eight. ^ "1954 Cleveland Indians Team". Baseball-Reference. Retrieved October 21, 2011. ^ "1954 New York Giants Team". Baseball-Reference. Retrieved October 21, 2011. ^ "1954 World Series Game 1 – Cleveland Indians vs. New York Giants". Retrosheet. Retrieved September 13, 2009. ^ "1954 World Series Game 2 – Cleveland Indians vs. New York Giants". Retrosheet. Retrieved September 13, 2009. ^ "1954 World Series Game 3 – New York Giants vs. Cleveland Indians". Retrosheet. Retrieved September 13, 2009. ^ "1954 World Series Game 4 – New York Giants vs. Cleveland Indians". Retrosheet. Retrieved September 13, 2009. ^ "Little Leaguer Throws Out First Pitch". The Marion Star. Marion, Ohio. September 30, 1954. p. 19. Retrieved August 25, 2018 – via newspapers.com. Cohen, Richard M.; Neft, David S. (1990). The World Series: Complete Play-By-Play of Every Game, 1903–1989. New York: St. Martin's Press. pp. 250–253. ISBN 0-312-03960-3. Hano, Arnold (2004). A Day in the Bleachers. Cambridge: Da Capo Press. ISBN 0-306-81322-X. 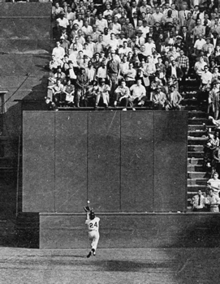 The author, who later wrote Mays' biography, described sitting in the left-center field bleachers at the Polo Grounds for Game 1. An entire chapter was devoted to "The Catch". Reichler, Joseph (1982). The Baseball Encyclopedia (5th ed.). Macmillan Publishing. p. 2162. ISBN 0-02-579010-2. History of the World Series - 1954 at The SportingNews. Archived from the original on 2008.